The Met Office have issues an amber warning for heavy snowfall in Calderdale this morning. 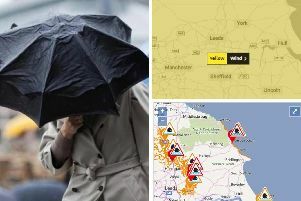 The warning is set to extend until 11am, with a yellow weather warning extended throughout today (Tuesday) and Wednesday. A Met Office spokesperson said: "Snow showers or longer periods of snow are expected on Tuesday, accompanied by very low temperatures. "The heaviest, most persistent snow looks likely to cross the area during the morning - the focus has been adjusted northwards to take into account latest ideas, removing Lincolnshire but adding more of Yorkshire and areas towards Manchester, Teesside, Durham and Newcastle. "There is the likelihood of travel delays on roads, with some stranded vehicles and passengers, as well as delays or cancellations to rail and air travel.